Spring Hill's Freedom rose was first bred in 1989 in the United Stated by Jerry Twomey from California. Jerry was the co-founder of a Winnipeg based nursery named T&T Nurseries. When he retired, he moved to California where he took up breeding roses for their hardiness and many of his successes have been introduced to the country and the world by Bailey Nurseries out of Minnesota. When you hear people talk about Freedom hedge roses, they are actually referring to Spring Hill's Freedom rose. 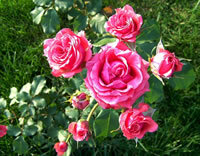 This rose is touted as being one of the most trouble free roses that you could decide to grow. That statement isn't all that hard to believe considering this rose has been bred specifically to be highly resistant to both insects and diseases. 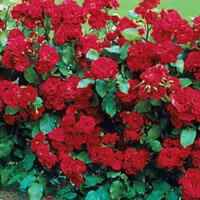 This beautiful rose produces an abundance of blooms ranging from a rich pink to a stunning scarlet color. Each double bloom will measure approximately 3.5" in diameter and will not only smell fabulous, but will last a long time as well. What makes the Freedom rose so great as a hedge rose is the fact that it only grows about 6 feet tall at maturity, and spreading out to a width of about 3 feet. This allows the rose to grow nice and dense and if you plant a row of them with 3 foot spacing between them, you can create a stunning hedge wall that not only looks and smells fantastic, but will offer privacy as well! How many roses offer you that quality? Growing the Freedom rose is much the same as growing roses of other types. You are going to want to choose a location that gets as much sun light as possible, at least 6 to 8 hours a day. The soil should be well drained and full of organic matter. Freedom hedge roses are highly resistant to insects and diseases and if you grow them with care, it will provide you with constant blooms starting in late spring all the way through to the first frost. The Freedom rose is not only a great choice for hedges, but it's an excellent choice if you want fresh cut roses around your home as well. This is one of those roses that you can take cuttings off of and it will keep on blooming again and again. If you are interested in a hedge of pink roses but don't want them to be 6 feet tall, the Freedom rose can easily be pruned shorter and still offer you amazing results. The Freedom rose is a really fast grower also so it won't take you very long to get your rose hedge up to size and looking great. One unique aspect about this rose is the gorgeous pink blooms will not fade and lose their color in direct sun light like so many other roses do. This makes for a great hedge of roses, especially on your property border where your neighbors can enjoy it as well…or be more than a little envious of you! Planting your Freedom roses is rather easy and all you really need is a shovel and a little bit of motivation to get the job done. I also highly suggest you pick up a bag of a good organic compost from the local garden center. When you dig your hole, mix in some of the compost with the loose soil before backfilling at a ratio of 1 part compost for every 2 parts soil. This stuff makes a wonderful amendment and works with just about any soil type you may have. Now how you plant your Freedom hedge roses depends in part on how you bought them. If you bought bareroot plants then you will need to dig a hole that is plenty wide enough to accept the roots without forcing them. You also should dig the hole deep enough so that you can mound up some soil in the center of the hole and still maintain a bud union depth of an inch or two. 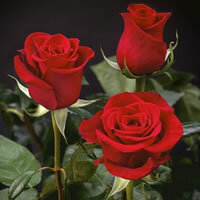 If you are planting multiple Freedom roses in a hedge, then plant them about 18 inches or so apart as that will allow them to grow to full maturity size, but it will also keep them close enough together to form the hedge that you are looking for. Take your new soil mix and back fill the hole halfway to begin with. Water the loose soil heavily until it is almost like mud, then back fill the rest of the way. What you are doing is making sure that the roots are completely covered and no air pockets have formed. If you got your Freedom hedge roses in containers then the roots are already established and you can dig a hole that is about twice the diameter of the container, and equally as deep. Taking care of your Freedom hedge roses is really easy. When it comes to pruning, most folks just use hedge trimmers on them like any other hedge and this works great. 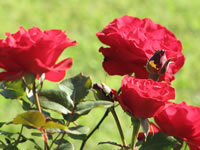 Just be sure to clean up your clippings and any dead leaves or debris from around the base of your roses. You can give your Freedom roses a dose of a good granular all-purpose organic fertilizer in early spring when the leaves start to bud. Since this rose is a continuous bloomer, you can feed it several more times over the course of the season. I usually stick to a 3 time per season schedule with the 2nd feeding being given just as the first big bloom starts to form, and the 3rd in the middle of summer around mid-July to encourage additional flushes. I've learned from trial and error to stay away from the liquid chemical fertilizers when it comes to roses. They work great on many other plants but I've burned one too many roses with them and have since decide to just stick with the granular fertilizers instead.